The plot of this movie is that the Muppets made a movie a few years back, and now they’re doing a sequel, but we’ve already established that. Anyway, you can’t convince people that’s a valid movie plot, so there has to be something going on. So, some guy named Dominic Badguy (Ricky Gervais) convinces the Muppets to take their show on the road across Europe, and also that his last name is pronounced “badgey”. Turns out Badguy is a bad guy, which you’d have to be a puppet not to see coming, but anyway, he’s teamed up with Constantine, the world’s most dangerous frog, to steal the Crown Jewels of England. 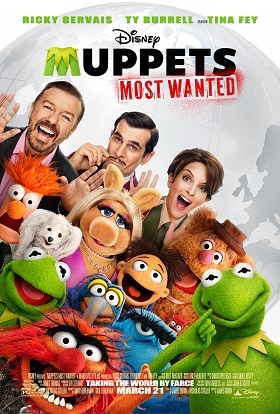 Their nefarious plot: replace Kermit the Frog with Constantine, use the Muppets to cover up their various robberies leading up to the final heist, and then pin the blame on them when they make their escape. Also, marry Miss Piggy as a final diversion. Despite Constantin’s ridiculous Russian accent, this plan works perfectly, and Kermit ends up in a Siberian gulag with Nadya (Tina Fey), Big Papa (Ray Liotta) and Danny Trejo (Danny Trejo). A pair of detectives, one French (Ty Burrell) and one American (Sam the Eagle) are on the trail of the thieves, but you know you’re in trouble when the blue puppet is the more competent one. Will the bad guys steal the crown jewels? Will the two detectives set aside their cultural differences and become a team? Will the Muppets new show be a success? Will Kermit escape the Gulag in time, and will his friends even realize he’s missing before its too late? Will Miss Piggy go through with this mistaken marriage? Will I really use this joke again? The humor in this movie is very meta. I happen to like that sort of humor. You may have noticed. If you happen to like that kind of humor, you’ll like this movie. The jokes come fast and furious, and it’s surprising how many of them work, and what works. For instance, Rizzo the Rat speaking one line complaining about how he’s only had one line in the last two movies almost makes up for the fact that Rizzo the Rat has only had one line in the last two movies. I happen to like Rizzo the Rat. You may have noticed. Once again, the songs are exceptional, with the aforementioned song about sequels being my favorite, though Constantine’s song for Miss Piggy is also pretty good. I think if I had to pick a favorite review of all my movie reviews, I would pick my review of The Muppets. I feel like it captures the essence of the movie under the microscope, and also allowed me to give you, the reader, a more open, honest and personal look at, well, me. It also features me blithering on about Roger Ebert, as I do from time to time. And, hey, this movie actually did review itself; it admits in that first song that the sequel is never quite as good. Which is true, but in this case, I don’t hate it when that happened. It’s that silly, self-deprecating part I like. And even though this isn't as good as The Muppets, it's not like that was a low bar. And don’t worry, Muppets, my sequel isn’t quite as good, either. In media res does not mean the story starts at the end (3rd act), in means it starts in the middle (2nd act). Starting at the end is more found in reverse chronology. That being said this movie will always have a special place for me since it is like one of only a very small handfuls that I saw in the theater with others. And alone in seeing it in a theater with someone who was not a family member. By the way, Badguy has a furry little secret. That reveal was probably one of the most hilarious of the movie, especially since I was watching it with another furry. I'm using it like it starts in the middle of action. Where in the story is inconsequential.